TIL or RDO settings are used to automatically apply these payments. If your employees are entitled to RDO's or TIL you can set this in the entitlement settings section of your Global settings. From the employee profile, you will need to enter the entitlements specific to that employee. If the employee is on a Salary with any overtime being added to Time in Lieu balance. Any hours short of the set basic hours will be added as TIL. Codes can be used to add a payment to the employee every time the code is present in the roster notes. This can also be used for Time In Lieu, for example, when an employee works an hour longer than normal. TIL balance when you run payroll. Please note, this only works if entered in minutes. 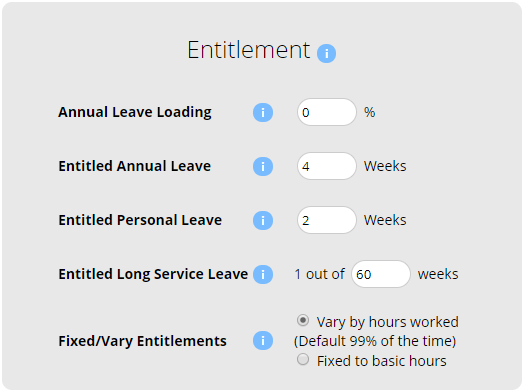 When you run payroll, the 60 minutes will automatically be taken off the total hours. The hour taken off is automatically added to the TIL balance.